Help publicize our athletes – Follow us on Twitter @UNI_Athletics– If you have a Twitter account and would like updates on how our UNI athletic teams are doing, you can follow us @UNI_Athletics. We will have updates from big games and from the GOWs (Game of the Weeks). It is another way to highlight our athletic teams and star performances by our athletes. We are up to 275 followers. Lets see if we can get to 300 by our homecoming game next week. Another exciting day at the races this last Friday at the Great Park for the Woodbridge Invitational which was run under the lights. Nearly 5000 athletes competed Friday night and another 5000 on Saturday night. Our top girls finisher was Janine Bryant followed by Freshman Sara Sussman, Freshman Abby Sanders, Junior Andrea White, Sophomore Madeleine Boschen and Senior Bessie Liu. On the Boys side the Freshman took 6th overall for their race while the Seniors took 2nd overall for their race. The top boy finisher was Senior Eric Kawana followed by Senior Eli Tita, Sophomore Christian Go, Sophomore Nathan Gali, Senior Mackhai Nguyen, Junior Luke Ruan, Freshman Abhishek Nisha Anish, Freshman Elias Cannesson and Freshman Cyrus Bower. The Girls and Boys Varsity teams will be competing in Palo Alto this weekend at the Stanford Cross Country Invitational while the remainder of the team will be at the Dana Hills Invitational. Go Trojan Running! Football – UNI and Calvary Chapel played a wild game last Friday night. If you were not able to attend you missed an extremely exciting game. Sam Winder opened up our scoring with a 2 yard TD run in the second quarter. Sam then added an 8 yard touchdown run early in the 4th quarter. Matt Abellaneda had a tough 3 yard TD run to give our team the lead with 6 minutes to go in the game. Calvary came back and tied the game with 3:36 left in the game and it looked like the game would end in a 21-21 tie. The last 2 minutes were extremely exciting and nerve-racking. Calvary scored on a 64 yard touchdown pass with just 36 seconds left in the game. Our defense then blocked the extra point to give Calvary a 27-21 lead. Alex Pourdanish gave our Trojans hope as he returned the ensuing kickoff to the 45 yard line. On the first play Neil Boudreau found Andre Campbell open over the middle for a 55 yard touchdown strike with just 18 seconds left. After two timeouts Nick Loveland put the extra point through to give our boys the 28-27 victory. With the victory our boys move to 3-0 on the season. We will travel to Estancia tomorrow night for a 7:00 game. Good Luck Football! Below is an article from the OC Register on our game with Calvary. Girls Golf – We beat Northwood last Thursday at Costa Mesa Golf Course. Sophomore Samantha Cabunag scored a 1-underpar, 35 for the lowest score of both team. Senior Ellen Takada shot a 38 and Eugene Rhee (sophomore) carded a 39. Unfortunately on Tuesday, we lost to rival Corona del Mar, 197-206 at Newport Beach Country Club. Our low score in that match was a 38 by both Takada and freshman, Kristin Shea. We then bounced back with a victory against Irvine on Wednesday. Takada had the low score of 35. We are now 2-2 in league. Girls Volleyball – Our volleyball team plays this afternoon v El Modena. Good Luck volleyball. Girls Tennis – The girls tennis team defeated Fountain Valley 13 to 5 last Thursday. Silke Hoffman won two of three matches at 2nd singles to lead the Trojans. On Tuesday the girls defeated Los Alamitos high school 11 to 7. Anja Seng and Kayla Agustin swept all three sets at 3rd doubles and Sahsa iraniha and Ashlyn Wang did the same at 1st doubles. Judy Kam once again swept all three sets at 1st singles. With the win the girls moved to 5 wins and one loss on the season. Uni opens league play on Thursday against Beckman. This past Tuesday, our boys varsity team fell at home to Marina HS in double overtime 15-11. The Trojans put up a good fight until the end, but with a few players in foul trouble, late in the game, we just could not recover to finish off strong. In last weekend’s Newport Rib Co. Classic hosted by Costa Mesa HS, UNI went 2-3 and although without one of its top scorers in Daniel Campanaro who was unavailable for the weekend, the boys in blue found enough teamwork to play aggressively in each game. UNI opened up the tourney with a 5-2 victory over Ramona of San Diego, then 3 losses in a row…6-14 vs Costa Mesa, 6-11 vs Yorba Linda, 6-7 vs St. John Bosco…the Trojans finished the tournament with a 10-5 win vs. Pacifica. Jacob Ghahremani ranks #4 in Orange County with 33 goals in 13 games while Daniel Campanaro has tallied 26 goals in 8 games for #18 on the OC charts. Jacob is #1 in Pacific Coast League while Daniel ranks #4… Kian Abolhoda is #2 in PCL in goalie saves. Great job Polo! Yearly Trojan Army Group Picture – Last Friday we took our yearly Trojan Army group picture. Below are two of the shots we took. Around 700 students showed up in their Trojan Army shirts for this picture. To date we have solf over 1100 shirts this year. Just another example of how great our student section is. WE ARE TROJAN ARMY STRONG! 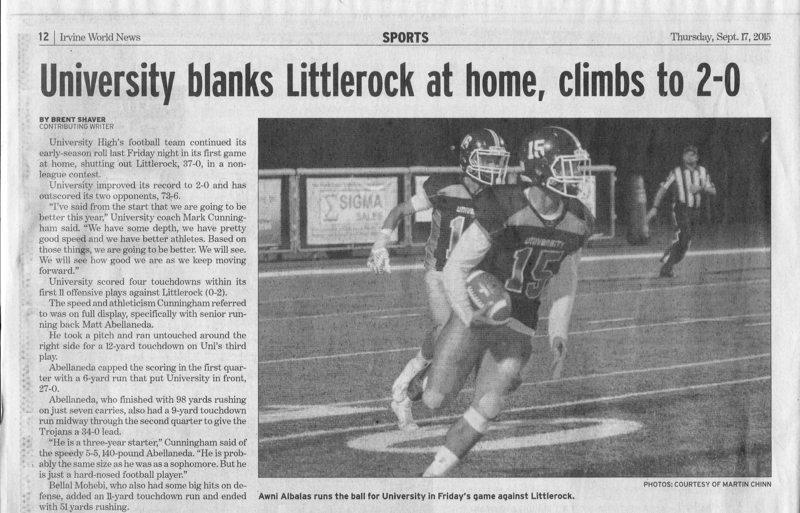 Football – Our football team moved to 2-0 with an impressive 37-0 victory over Littlerock last Friday night. Our boys jumped out to an early 27-0 lead after the first quarter and pushed the score to 34-0 at halftime. Matt Abellaneda led all scorers with three touchdown runs. Bellal Mohebi added another rushing touchdown and Michael Jung caught a 23 yard touchdown pass from Neil Boudreau. Nick Loveland capped the scoring with an 18 yard field goal in the second half. Our defense put up another dominate performance giving up less than 100 total yards for the game. Tomorrow night our Trojans are back at home as they will take on Calvary Chapel. Game time is 7:00. Wear your Trojan Army or Carolina blue shirt to the game to show your Trojan Pride. Good Luck Football! Below is an article on our boys big win last week. Girls Golf – In a matchup of two top ten teams, our girls fell to Beckman at Tustin Ranch (Their home course) by 4 strokes on Monday. Sophomore, Kristin Shea is playing really well. Last Thursday at Mission Viejo Kristin shot 38 (+2) and Monday she carded a 35(-1). Our girls are back in league play this afternoon as they take on Northwood. Hit them straight ladies. Girls Volleyball – Our girls volleyball team is back in action next Wednesday as they travel to Tesoro. Good Luck Volleyball. Girls Tennis – The girls tennis team moved to 3 wins and 1 loss on the season with a win over third ranked Dana Hills on Tuesday. Currently ranked #1 in Orange County, the UNI girls won a very close match led by senior captain Judy Kam. Kam swept all three matches playing #1 singles. Freshmen Dana Feng won two of her three matches at #2 singles and Ashley Wang and Sasha Iraniha won two of three sets playing 1st doubles. Last Thursday the Trojan girls defeated Fountain Valley 13 to 5. The girls return to action with a match against Tesoro here at UNI on Thursday. Good Luck Girls Tennis! Boys Water Polo – UNI Varsity Boys Water Polo team currently has a 5-2 season record going into this weekend’s Newport Rib Company Classic Tournament hosted by Costa Mesa H.S. Daniel Campanaro (Jr., #8) ranks #4 in Orange County and #1 in Pacific Coast League with 25 goals scored in 7 games, while Jacob Ghahremani (Sr., #3) ranks #11 in Orange County and #4 in Pacific Coast League with 20 goals. This past Tuesday 9/15, the Trojans beat visiting Long Beach Poly 13-7. Campanaro lead UNI with 5 goals while Ghahremani, Brad Nunamaker and Kei Yoshikawa followed with 2 goals a piece. Ben Gomez and Scott Laske added a goal each to put the team in a convincing lead. Great team play by Asha Ezzati fueld the fire for UNI’s command. Caleb Brown, Kian Abolhoda, Daniel Briseno and Ryan Eid contributed immensely to the Trojan Army. This past weekend 9/11-9/12, the varsity boys went 3-2 at the Chris Weisz Memorial Tournament hosted by El Dorado H.S., the Trojans started out with a 10-6 victory over Pacifica followed by a 19-6 loss to Mater Dei. UNI bounced back the next morning beating Peninsula 8-5, after a tough 9-6 loss to St. John Bosco, the team finished strong with a 14-7 win over Palos Verdes. Next Tuesday Sept 22nd, the Trojan poloists will host Marina H.S. at the UNI pool, varsity game at 4pm. Come cheer the team on! Snack Shack will be open. Tomorrow is another TROJAN ARMY DAY! Encourage your student to wear their Trojan Army shirt to school tomorrow. It will be a sea of blue tomorrow on campus. If students want to sit in the student section tomorrow night they must be wearing a Trojan Army shirt. Students not wearing an Army shirt will sit on the other side of the band. We are the one true spirit section in the city and we want to show everyone we play how much spirit we have. Yearly Trojan Army Group Picture – On Friday during the last 10 minutes of homeroom all students wearing their Trojan Army shirt will be dismissed from class and will head to the stadium for our yearly group shot. Please encourage your student to wear their Trojan Army shirt to school tomorrow so they can be in the picture. Football Game tomorrow night – We are expecting another large crowd tomorrow night. If you plan on attending the game please arrive early to ensure you get a parking space. Wear the colors tomorrow night – Parents and UNI supporters – Please wear light blue to the game tomorrow night. Better yet if you have a Trojan Army shirt please wear that to the game. If you do not have a Trojan Army shirt and wish to buy one they are available in the athletic office for $15. Army shirts will also be available at the game. New Cheers at Football Games – Last week we started a new pre game cheer. It went well but has not fully caught on yet. Parents we need your help. We will do a LETS GO TROJANS cheer as our boys are taking the field tomorrow night. The Trojan Army will have LETS GO and the Parents and Band will have TROJANS. Please show your Trojan pride by getting involved and yelling out TROJANS tomorrow night. Welcome to Trojan Thursday – So what exactly is Trojan Thursday? Trojan Thursday is a weekly email to give the UNI community an update on what is happening with our UNI varsity athletic teams and will also give information as to major events that are happening on campus. If you would like to receive Trojan Thursday each week please go to https://unitrojanthursday.wordpress.com and type in your email address. You will receive a notice each week when Trojan Thursday is posted. Please help spread the word about Trojan Thursday so everyone can hear about how our athletes are doing. Boys and Girls Cross Country– Our runners have been working hard all summer. Both teams have been workout out since early August. Both teams traveled to Yosemite for a week of training and team bonding earlier in the summer. Our teams kick off their season this weekend at Laguna Hills. Good luck runners. 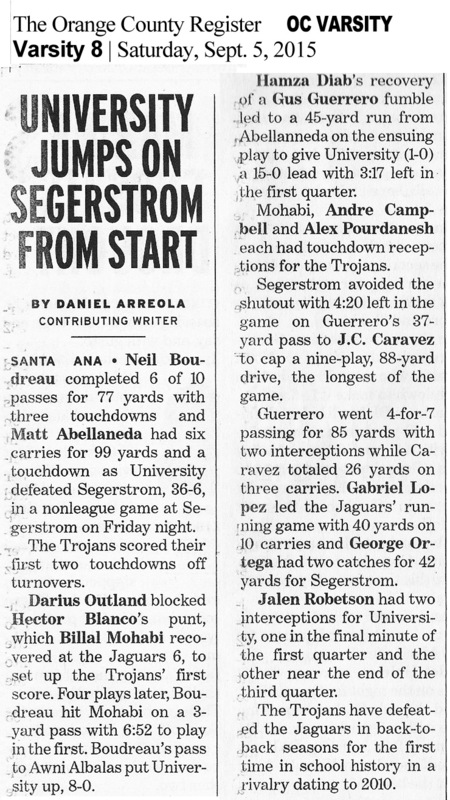 Football – Our boys opened their season last Friday night with an impressive 36-6 victory over Segerstrom. Our boys jumped out to a 22-0 halftime lead. The lead was pushed to 36-0 before Segrestrom scored in the final minute. Matt Abellaneda led all rushers with 99 yards. He had an impressive 45 yard touchdown run where it looked like Segrestrom had him tackled and he escaped and raced to the endzone. Quarterback Niel Boudreau threw two touchdown passes. The first was a 22 yard strike to a wide open Andre Campbell in the back of the endzone. The second was an 11 yard pass to Alex Pourdanesh. Our UNI defense seemed much quicker and more physical than the Segrestrom offense. Our defense was led by Jr transfer Jalen Robertson who recovered a fumble for a touchdown and had two amazing interceptions. Needless to say he was the defensive player of the game. Our Trojans will be back in action tomorrow night as they play their first home game of the season. Lest get everyone out to the game wearing Trojan Army blue to support our team. Game starts at 7. We are expecting a large crowd so get there early if you want a parking spot. Below is the OC Register article from last week. Girls Golf – Our Girls Golf team is off to a great start. This year’s team has a good mixture of young talent and successful veterans. We have played three matches and won all three. We went 2-0 vs Tesoro. In the first match, Nodoka Honda (Fr) was our low scorer at 38 at Coto de Caza Country Club (Par 36). We won 203-228. In the second match, senior Ellen Takada led all scorers with a 34 at Strawberry Farms (Par 36). We won 196-225. Yesterday, we played against Mission Viejo at Strawberry Farms and defeated them 182-241. Again, the low scorer was Takada with a 33. We expect to have a successful season in our league matches, which begin Monday at Beckman. For the past 4 years, Beckman has won the league three times, while we finished in first once. Our opening match in the PCL this coming Monday is going to be a tough one. Great start to the season golfers and good luck in your big match on Monday. Uni Girl’s Volleyball played Mission Viejo at home on Tuesday and while they lost a close 5 set match there were some very encouraging aspects of the match. Uni played great team defense led by Ashley Kim and Klaire Thoman. Kira Cashman led the Uni offense with 23 kills. The match was a valuable learning experience for the team and they are back in action against Foothill today and at the Dave Mohs Tournament this weekend. Good Luck Volleyball! Girls Tennis – The girls tennis team got off to a great start to the season with an 11 – 7 victory over a very good and highly ranked Santa Margarita team last Thursday. Judy Kam won two of three sets at #1 singles to lead the Trojans. Senior captain Michelle Maddox and junior Ashlyn Wang swept all three sets at #1 doubles and senior captain Melina Gharibian and senior Silke Hoffman swept at 2nd doubles. Freshmen Dana Feng got her first varsity victory playing #3 singles. On Tuesday the girls traveled to Studio City and lost a very close match to Campbell Hall (9-9 on set score but lost on games). Once again Judy Kam won 2 of 3 sets in singles and Michelle Maddox and Ashlyn Wang swept at 1st doubles to lead the Trojans. A quote from Coach Kessler – “I am so proud of these girls. With 5 new girls in the line-up and playing the best teams in division 1, these girls have worked so hard in practice. Team chemistry has been tremendous and our younger players have really stepped up”. The Uni tennis program also got a tremendous boost when we added former Los Alamitos head varsity coach Kevin Garrett to the coaching staff. “Kevin has brought so much to this program in the short amount of time that he has been with us”. We are very lucky to have him wearing Trojan blue and white! Tomorrow is TROJAN ARMY DAY! Encourage your student to wear their Trojan Army shirt to school tomorrow. It will be a sea of blue tomorrow on campus. If you want to sit in the student section tomorrow night you must be wearing a Trojan Army shirt. Students not wearing an Army shirt will sit on the other side of the band. We are the one true spirit section in the city and we want to show everyone we play how much spirit we have. Football Game tomorrow night – We are expecting a large crowd for our home opener. If you plan on attending the game please arrive early to ensure you get a parking space. Wear the colors tomorrow night – Parents and UNI supporters – Please wear light blue to the game tomorrow night. Better yet if you have a Trojan Army shirt please wear that to the game. We want to overwhelm Little Rock with a sea of Blue tomorrow night. If you do not have a Trojan Army shirt and wish to buy one they are available in the athletic office for $15. New Cheers at Football Games – Parents we need your help! We will do a LETS GO TROJANS cheer as our boys are taking the field tomorrow night. The Trojan Army will have LETS GO and the Parents and Band will have TROJANS. Please show your Trojan pride by getting involved with these cheers. Fall Sports Assembly – Tomorrow we will be recognizing all of the varsity fall sports at our fall sports assembly. Our assemblies also get everyone on campus fired up. It should be an exciting day at UNI tomorrow.